Allegheny women prepare to swim a relay against teams from Edinboro University and Gannon University on Friday, Nov. 9, 2018. The Allegheny swimming and diving team brought Division III strength to its annual Allegheny Gator Invite on Friday, Nov. 9, and Saturday, Nov. 10. 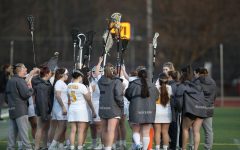 The Gators faced Division II Edinboro University and Gannon University. 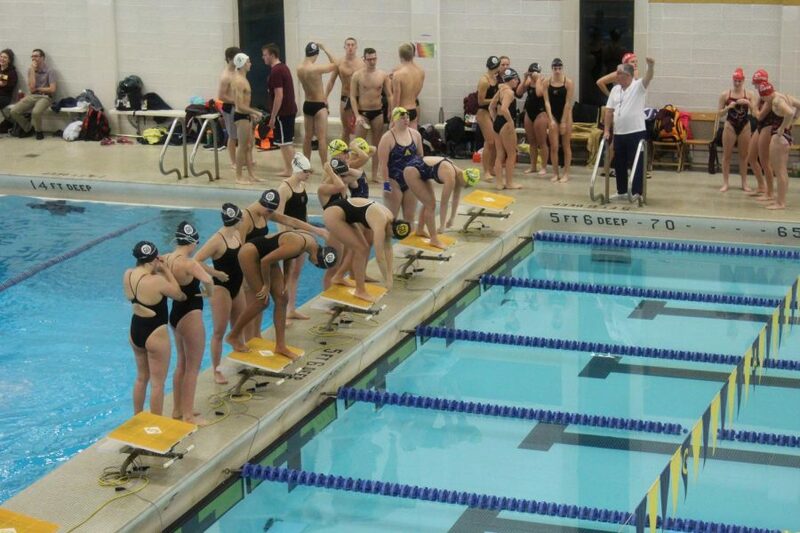 The Gator women emerged with 803 points to best Gannon, with 582 points, and Edinboro, with 468 points. The Gator men earned 686 points and took second, falling to Gannon with 803 points and defeating Edinboro with 384 points. “It can be a little bit daunting, and it’s a challenge, and it’s something that we take with pride that we’re able to compete with Division II schools,” said Head Coach Max Niggel. 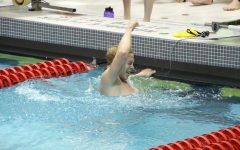 The invitational was marked by “a lot of nitty-gritty swims,” according to Assistant Volunteer Coach Rebecca Dawson, which included wins, in-season bests, and lifetime bests by multiple athletes. The women were led by Anna Verardi, ’21, and McClaren Rodriguez, ’21, who both recorded two victories in individual events. Rodriguez recorded a lifetime best with her 1:59:81 time in the 200-yard freestyle. 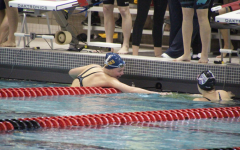 “That’s the first time we’ve had a female under two minutes in season in the longest time that I can remember,” said Dawson, who is both a coach and a 2000 alumnus of the Allegheny swim program. Lauren Isaacs, ’22, Emily Schaefer, ’21, and Aimee Verardi, ’22, each recorded individual victories. Verardi also contributed to the team score with “really amazing” relay splits, Dawson said, including the first-place 400 freestyle relay consisting of Aimee and Anna Verardi, Miranda Farley, ’21, and Rodriguez. Several swimmers, including Alyson Codner, ’21, Farley, and Sadie Brown, ’22 recorded seasonal best scores at the invitational, and Paige Pethtel, ’22, recorded a lifetime best. Brown recorded a personal best in her debut in the 100 fly, coming in third behind Allegheny’s “two most skilled flyers and one of the most skilled flyers in the conference,” according to Niggel. “For her to place third and pull off an excellent time was a huge thing,” Niggel said. Brown also had an impressive showing on the diving board, according to Hunter Pietrzycki, ’21. Chelsea Pietrzycki, ’22, and Brionna Litwin, ’21, each recorded a diving victory and qualified for the regional meet in the spring. Hunter Pietrzycki, won both the one-meter dive and the three-meter dive for the men, scoring 337.25 and 369.45 points in the two events, respectively. The points he earned contributed to an overall score tying the men’s best-ever performance at the annual Allegheny Gator Invitational. Justin Katchur, ’21, brought home two victories in the 100-yard and the 200-yard breaststroke. Karl Stuntzner-Gibson, ’21, won the 200-yard freestyle with a time of 1:46.02. Logan Indest, ’21, contributed three second-place finishes to contribute to the men’s second-place overall finish, along with two top-three finishes by Brian Corletti, ’20. Niggel attributed the win and the multiple drops in time in part to the team’s sheer determination. Hunter Pietrzycki echoed the importance of the team’s dedication and commented on the positive team environment cultivated by the coaches. Dawson also attributed the team’s success at the invitational to excellent coaching by Steider and Niggel. Niggel also brought unique expertise to this particular invitational as an Edinboro University graduate and a former coach for Gannon University. The 2018 Allegheny Gator Invitational is the most recent evolution of a Gator tradition, according to Dawson. In its original form, the invitational was split into a Friday night series of sprint events with distance events held on Saturday. She said the invitational began under former Head Coach Tom Erdos, who was head of the Allegheny Swimming and Diving Program for over 30 seasons from 1977 to 2007. According to Niggel, the initial plan was to call the invitational the Erie Cup and invite Erie-area schools, but difficulties scheduling with Penn State Erie, The Behrend College and the addition of Lockhaven to the roster in past years led to the name change. “The purpose of it was to swim some local teams with equal talents to give that invite-style feel and give people the opportunity to swim against people that would push them,” Niggel said. As the team prepares to move forward with its season, its win at the invitational will serve as a reminder of their ability to compete, according to Niggel. Last year, the Allegheny women took fifth and the men took seventh in the conference. Niggel is looking to see the women move into third or fourth and the men take fourth or fifth this year. The Gators will compete again this weekend as the divers travel to the Carnegie Mellon Invitational on Friday, Nov. 16, and Saturday, Nov. 17, and the swimmers travel to the Malone University Invitational on Saturday, Nov. 17.